These Garlic Butter Roasted Carrots make the perfect side dish for your holiday dinner! They're on the table in under 30 minutes with only 4 ingredients! Add the baby carrots to your favourite 9-inch by 13-inch (or equivalent size) baking dish. 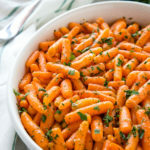 Combine the melted butter with the garlic powder and dried parsley and drizzle it over the carrots, tossing well to coat. Roast at 375 degrees Fahrenheit for about 25 minutes or until the carrots are just barely fork tender.